Cory Schneider made 37 saves for his first shutout of the season and the 24th of his career Wednesday as the New Jersey Devils defeated the Vancouver Canucks 2-0. The Vancouver Canucks are probably glad they traded Cory Schneider to a team in the Eastern Conference. 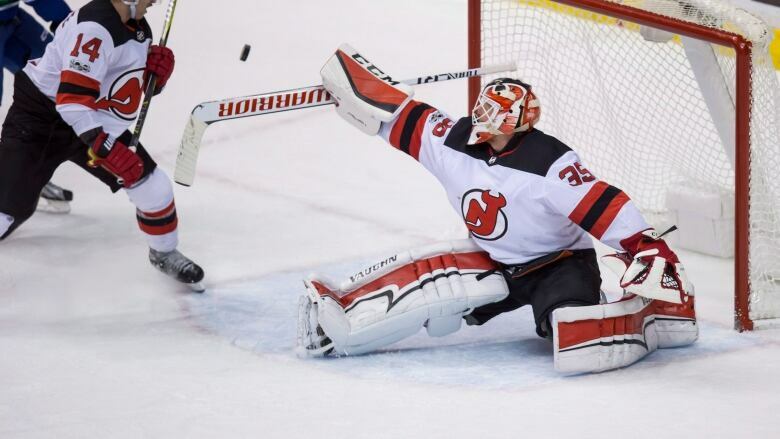 Schneider made 37 saves for his first shutout of the season and the 24th of his career Wednesday as the New Jersey Devils defeated Vancouver 2-0. Dealt to the Devils for the ninth overall pick at the 2013 draft that the Canucks used to select centre Bo Horvat, the 31-year-old Schneider improved to 5-1-2 against his old team — including five straight wins — to go along a .940 save percentage. "I've always loved playing in this city and this building," said Schneider. "I've always felt really comfortable and at home here. It was fun." Jimmy Hayes and Drew Stafford, into an empty net, scored for New Jersey (9-2-0), which surpassed the 1993-94 Devils for the best start to a season in franchise history. "It's nice to see the guys get rewarded for a lot of hard work," said New Jersey head coach John Hynes. "We [talked] in training camp about the way we wanted to play and the work ethic we wanted to have." The Devils have now won three straight and remain the NHL's only team with a perfect road record (5-0-0) to sit atop the Metropolitan Division. "We've been scoring a lot of goals," said Schneider. "But it felt like it was time to spin a game like this and get my teammates some help." Jacob Markstrom made 24 saves for Vancouver (6-4-2), which had 80 shot attempts to New Jersey's 42, and has lost two in a row following Monday's 2-1 overtime setback against the Dallas Stars. "They had 21 blocked shots," said Canucks head coach Travis Green. "We might have cut our shots a little too fine, but you are either shooting to score or shooting to get a rebound. "We had a lot of both." New Jersey snapped the scoreless tie at 10:09 of the second period after Canucks rookie Brock Boeser saw his shot blocked in the offensive zone. The Devils raced the other way, with Markstrom stopping Hall's initial effort on a 2-on-1, but the puck bounced past Vancouver's backcheckers right to Hayes, who blasted a one-timer for his third of the season. "Bit of a knuckler," said Markstrom. "I got a little eager to get out and get it, it kind of curved in. You want that back, especially in a game like this." The Canucks came close to grabbing the lead earlier in the period when Daniel Sedin's redirection off a slap pass from twin brother Henrik from the high slot though a screen hit the base of the post and stayed out. Schneider had to be really sharp on a four-save sequence with under three minutes to go in the period after the Devils went ahead, saving an Alexander Burmistrov one-timer before also stopping two off the stick of Sam Gagner and another from Alex Biega. "Cory was the difference tonight. He was fantastic," said Hynes. "The result would not have happened if Cory didn't play as well as he did." Wednesday marked the return to the New Jersey lineup of forward Brian Boyle, who announced on Sept. 19 he was battling myelogenous leukemia, a form of blood and bone marrow cancer. The 32-year-old takes medication when he wakes up and before he goes to bed, and had been practising with the Devils since last week. "The guys in here, the last six weeks, whether they know it or not ... it's just been a tremendous boost of energy for me," said Boyle, who finished with 15:19 of ice time in his first game since April 23. "I can't thank them enough." Playing just 11 forwards after Marcus Johansson was injured less than a minute into the first period, Schneider and the Devils killed off two Canucks' power plays in the third. Vancouver kept coming, but Sven Baertschi shovelled wide of an open net off a feed from Horvat. With Markstrom on the bench for the extra attacker, Schneider stoned Derek Pouliot with just over a minute to play and then Daniel Sedin with 42 seconds left before Stafford scored his fourth into an empty net to seal it. "We should have won this one," said Daniel Sedin. "Give [Schneider] a lot of credit. "When he's on his game he's really good."